VietNamNet Bridge – The number of students becoming the victims of overseas study consultancy firms’ trickeries has been increasing. Meanwhile, the firms cannot be prosecuted for their swindling, because there has been no regulation on the punishments. This recent article, the latest in a large number that I’ve seen over the years, documents abuses perpetrated by overseas study consultancies in Vietnam, otherwise known as agents. It’s still the Wild West for many of them, whose business practices are driven by greed and a total disregard for the people they are supposed to serve. In most cases, the victims do not know where they should go and whom they should contact to ask for help. On the afternoon of October 29, a lot of parents came to Atlantic’s head office in Thu Dau Mot City of Binh Duong province to claim the tuitions back. Atlantic introduces itself as an international education and training school. The parents said they paid 4000-10,000 dollars worth for consultancy fees and the procedures for their children’s overseas study. The problem is that the money was paid one year ago, but their children have not received any information about the overseas study. On VietAbroader.org, a forum of the Vietnamese students in the US, a member wrote that he followed the procedures for overseas study via a consultancy firm headquartered on Le Van Sy Street in HCM City. The firm’s leaflet says that every student has to pay 300 dollars for preparing documents and translation services, and that the procedures would be fulfilled after three months. However, in fact, when signing contracts with the firm, clients were asked to pay a series of other kinds of fees, including the 250 dollars for the translation and communication fee, 700 dollars for remittance service, 400 dollars for other kinds of fees. In order to get visas, they would have to pay another 1000 dollars. However, the member of the forum did not get visa. The firm then asked him to pay 6000 dollars more, ensuring that he would get visa soon, but the promise did not come true. After a lot of negotiations, he has claimed 7000 dollars back, while the remaining money has not been refunded, because he could not show the invoices to prove the payment. The two key points are: 1) In most cases, the victims do not know where they should go and whom they should contact to ask for help; and 2) “the firms cannot be prosecuted for their swindling because there has been no regulation on the punishments.” Simply put, the system is lacking in checks, balances and accountability. Many people refuse to suffer silently and will find an outlet, usually online (e.g., VietAbroader.org and the media) and within their personal networks, to voice their complaints. 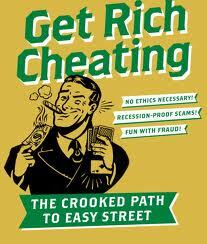 Media coverage of cheating and fraud is helpful but its impact limited. What’s needed is a clearinghouse to log all of these complaints and a government office that will act on them. Parents are desperate to work with companies that treat them and their children with fairness and respect. They are looking for quality, value and transparency. This rising tide of expectations, along with official follow-up and punishment, when necessary, will ultimately put the “bad apples” out of business. One of the values of my company is integrity: We adhere to the highest ethical standards in every dimension of our work and believe that transparency is not just the right thing to do but good business. That pretty much sums it up, IMO. P.S. : Maybe it’s time to create an association whose members consist of companies that pledge to adhere to a strict “client’s bill of rights.” In a culture in which corruption is rampant, chasing after money the order of the day and cutting corners business as usual, it would be a very select group indeed. Thanks, Rachel, for your question. AIRC’s a worthwhile attempt to professionalize the education agent business through certification (“accreditation lite”) but it’s limited in scope and what it can accomplish. And it’s obviously not responsible for the activities of non-certified agents. That monitoring has to come from local authorities, for example, departments of education and training in Vietnam that issue licenses to overseas study consultancies. Then it becomes a matter of staffing and priorities. Furthermore, AIRC is not well-known around the world and the certification process is quite expensive. Therefore, it’s mainly the larger companies that opt for AIRC certification as a means of demonstrating to US colleges and universities that they are reputable companies. Since business is based on relationship, reputation and quality, not every company has a need to obtain AIRC certification unless the majority of US HE institutions require it as a prerequisite to doing business.